VICTORIA – New Democrats revealed more evidence that the culture of cover-up and deceit in the B.C. Liberal government starts at the top, and exists throughout the political level of government. New Democrats made a Freedom of Information request for correspondence in November of 2014 from Tobie Myers, Chief of Staff to LNG Minister Rich Coleman. The request resulted in three emails being released. But newly uncovered message tracking logs showed 800 emails , many of them to key figures in the LNG industry during a period when the B.C. Liberals were finalizing the details of their generational tax giveaway to Petronas. 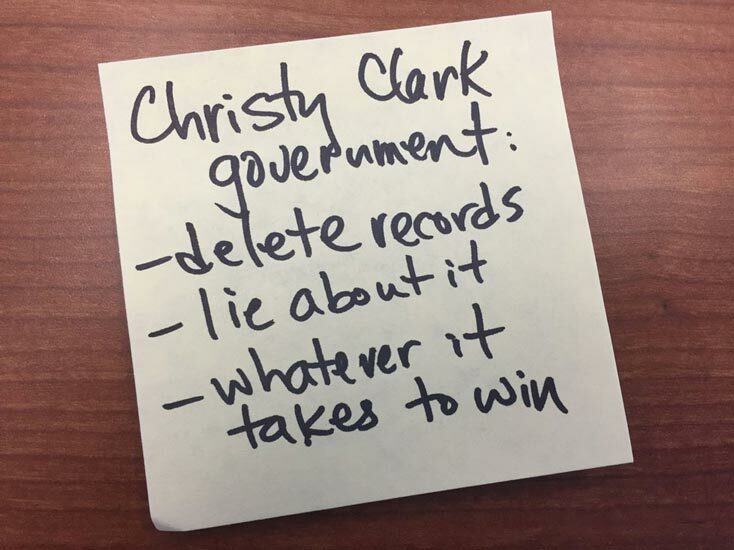 The revelations come hard on the heels of a damning report from the Information and Privacy Commissioner, who found the illegal practice of triple-deleting emails was widespread in the office of Premier Christy Clark and throughout her government. The commissioner also sent the file to the RCMP, after a Liberal staffer admitting to lying under oath.